Whilst horses are very adaptable to colder weather, they still need to be fed and managed appropriately when more extreme weather hits. Follow these essential guidelines to help keep your horse happy and healthy when it’s cold and snowy outside. 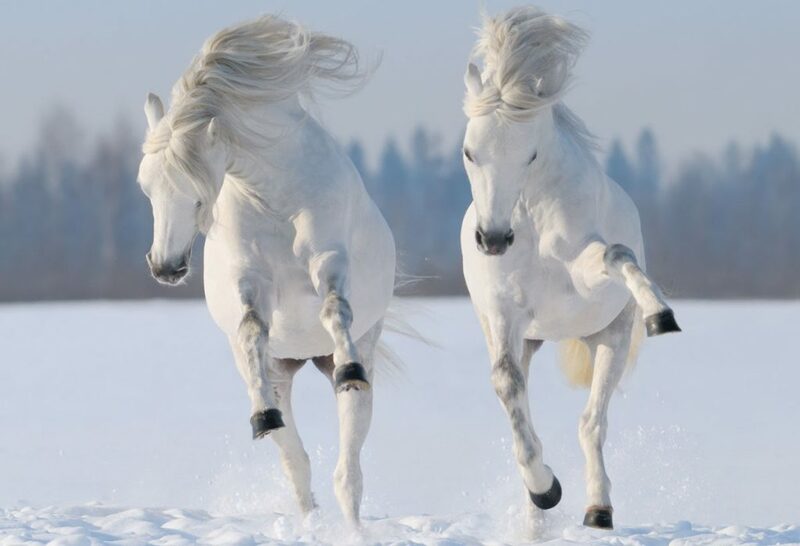 In colder temperatures, a horse’s energy requirements will increase to maintain their core body temperature of 38 degrees. The environmental lower critical temperature (LCT) is the temperature below which a horse will need extra feed and protection to keep warm and maintain the core temperature. For uk based horses, the LCT is normally around 0 to 5 degrees depending on coat length, age and body condition but for clipped horses it is 6 degrees or over. This is actually much lower than most horse owners realise and means that our horses can endure cold weather far better than you might think! However, with the massive cold snap that is currently hitting the UK, we’re experiencing temperatures below our horse’s LCT and so we need to ensure we help keep our horse’s warm and cosy to get them through to spring. As a general rule, a horse’s energy requirements increase in colder weather by 1% for each degree the temperature drops below their LCT. Providing additional, good quality forage is the best way to supply additional energy and warm your horse up in colder weather. The microbial fermentation of forage in the hindgut produces heat which really helps to keep your horse warm from the inside out in very cold weather. An easy guideline to follow is that a mature horse will need two per cent more forage for every degree the temperature falls beneath the LCT. For example, if you horse is getting 10kg forage per day then he would need 0.2kg extra per degree, so if the temperature drops to 10 degrees below the LCT, that’s around 2 kilos of extra hay per day to maintain body warmth at that temperature. 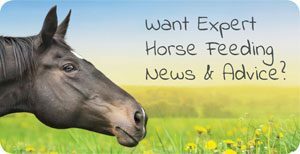 Extra hay can be provided in the field if your horse is turned out, which is particularly important when there is snow on the ground and he might be struggling to get any grass. Beginning to feed extra forage at least 24 hours in advance of extreme cold or winter storms can be beneficial, so that your horse is already prepared when it hits. Horses in good body condition, with a thick winter coat should cope fine in colder temperatures providing they are getting extra forage. If you have an older, clipped or underweight horse, however, they should ideally be rugged as well to ensure they stay warm and comfortable during the chill. Ensuring that your horse gets enough water is very important in colder weather as he or she will be inclined to drink less the colder it becomes. Additionally, if they are receiving extra forage such as hay they will require more water because it is much drier than grass. Water buckets and troughs can easily become frozen when the temperature drops, so breaking ice regularly is essential. Adding hot water to warm up drinking water to above freezing has been shown to increase water consumption. Additionally, providing 1-2 tablespoons of salt in feed (or loose in a bucket if your horse will eat it) is a great way to stimulate thirst for good hydration. Placing some insulation around taps to prevent them freezing over is a good idea to help ensure you have free running water to give to your horse. Shelter is especially important when your horse is turned out to give them the chance to get out of more extreme conditions if they need to. Horses with access to a shelter can conserve up to 20% more body heat than those in more exposed areas. A three-sided shelter is ideal to help keep your horse warm, but natural shelter from a thick covering of trees will work equally well. Providing bedding in a shelter can help encourage your horse to lie down, which in turn can reduce surface area heat loss by 20-25%. If your shelter is big enough, extra forage can be placed inside to enable your horse to eat whilst being protected from the elements if needed. Plenty of turnout is always beneficial for your horses’ health and being able to move about in a spacious field will generate heat to help keep them warm. Quite often horses in cold weather will stop eating and run about to warm themselves up, so it’s important to give them the opportunity to do this. Spreading out piles of hay or haylage around the field can help encourage your horse to move about and generate extra heat. Most horses once given the opportunity to acclimatise to colder weather often prefer and are better off outdoors. If you decide to stable your horse for extra protection, during colder and snowy periods, try to ensure he gets out during the day to facilitate movement and create some extra warmth. By being prepared for extreme weather with the right care and feeding, you can help ensure it becomes less of a challenge and your horse stays happy and healthy throughout.